Is that true? If it is, my heart breaks for you. Believe me, there’s not a single church-related heartbreak or disappointment I haven’t already endured. However, there is something simple you can do to turn things around. What you need to do is develop a Christ-like love for your brothers and sisters, then even the worst of disappointments will have a hard time turning your heart cold. You could start by repeating the following statement over and over: “Because He first loved me… Because He first loved me…” Why? Because He first loved you (1 John 4:19)! Believe it or not, Jesus loved you long before you were loveable…long before you stopped breaking His heart on a daily basis…long before you became perfect and quit messing up. Wait, you are perfect, aren’t you? No? Wow! And He loves you anyway? So, if you would just try to love others the way Jesus loves you – faults and all – His Spirit would turn those tears of disappointment into healing streams of grace. Then, if you’d keep your worship more vertically oriented and less horizontally irritated, there’d be a lot fewer things to complain about. P.S. Service times haven’t changed, and no one has claimed your seat. It is just after midnight on Monday morning. I’m in bed, ready to go to sleep, but something is keeping me awake a little longer, and it’s the sting of something my youngest daughter said. You see, she had come home from an over-nighter with some friends, and it was their house that got her attention. She noted the artistic way the place was decorated; the years of family photos that graced the walls; even a special area where one daughter’s paintings hung for all to see. We live in a parsonage, the second one in ten years. The last place we lived was only a temporary stop until this parsonage was livable. All other places we’ve lived during her first 7 years of life were rentals. The fact is, sadly, we live in a house, but we don’t have a home. My 17 year-old daughter has never lived in a place where family would always be, put down roots, and call it our own. We are nothing more than transients. That’s the life of a bi-vocational pastor and his family, just trusting the Lord to keep a roof over our heads till we are asked to leave or God opens a door. Not very glamorous, for sure. But, to be honest, there’s a lesson that’s not been lost on me during all this. Simply put, nothing on this earth will last forever, not even the deed to a home. No matter who we are, we’re all pilgrims in this world. As a matter of fact, living in a borrowed place down here just reminds me of how this world is not my home, I’m only passing through. No, I don’t own a home down here, but at least I know where my real home is. One day I’ll go there, and you’re all invited. I bet my daughter will even be impressed with the way the Builder decorated it. Thinking Out of the Box? Or Out of My Mind? It should be common knowledge for most of you, at least those of you who regularly read my blog – because you are the more intelligent of all readers – that not all pastors are “fully funded.” In other words, over half of church pastors are what we call bi-vocational (i.e., they work at least a second job). Well, it might come as a surprise to learn that many pastors, such as myself, receive no compensation from a denomination, either. At best, most bi-vocational pastors receive a small or modest salary and possibly an expense account, even more rare a parsonage (house). In other words, we are not getting wealthy from what we are called to do. You see, the fact is that mega-churches make up only a small percentage of all churches. The vast majority of congregations in America have regular attendances of less than 400, and a good 30+% have less than 100 regular members. Why, then, would one choose to enter the ministry (accept the call), spend tens of thousands of dollars on years of education (4-10), only to expect a career that pays, on average, less than a 1st-year school teacher? Believe me, it’s not about the money. We do it because we are called. We go because we are sent. And, in whatever way we can, if we have to, we will make tents (Acts 18:3). That’s why we work more than one job, if we have to, so that we can do what pastors do – shepherd the flock of God. But here is where I feel I was thinking out of the box yesterday afternoon: What if bi-vocational pastors could be supported like missionaries? Stop and think about it. There are some areas where churches are few, and the ones that are there cannot afford to pay a pastor any kind of living wage (and, by the way, it’s biblical to pay a pastor). These little churches would love to have a seminary-educated minister teach and preach the Word of God, but most of the time end up searching for years until they wind up accepting whomever they can get. Not a good situation. What if pastors of smaller congregations could raise support, much like what many missionaries do before going into the field? You do realize that the small, bible-teaching church down the road – the one which still serves a purpose and meets a specific demographic need – is still as important to the Body as the large church on the hill, don’t you? Whenever a small church closes its doors because of a lack of available leadership, the whole Kingdom suffers. Would it not be reasonable, therefore, to suggest supporting at least in some small ways, the pastors of these churches? Granted, there must be some considerations, but is it not a reasonable thought? Pastoring a church takes time, and there are only so many hours in the day. When one has a family (if only a wife), puts 20-30 hours a week into church-related work and activity, and then has to maintain a “secular” career on top of that, something will suffer. When you add to the mix a pastor who is primarily trained and educated in ministry, not a technical skill-related field, the types of employment available – including the hours and days one must work – become more and more limited. Am I thinking out of the box, or am I out of my mind? Are there ways this could be developed? Would it be something you would consider? Are there other options worth exploring? I don’t know how it happens, but somehow my email gets flooded with “half-off” offers and all such craziness. Even though I delete cookies, unsubscribe to stuff, and threaten friends, people still send me links to things I can’t afford. Now, honestly, not all of the ads are worthless. As a matter of fact, if I had the money, I’d take advantage of some of the Groupon offers. Come to think of it, I should have taken advantage of some of those coupons before my last anniversary! Dang it! Why didn’t I think of that? Once, on Facebook, someone sent me a link to a company selling t-shirts. The one that caught their attention was one that read, “I’m a School Bus Driver. What’s your superpower?” I thought that was cool! Alas, I didn’t have $20 to spend on a t-shirt, even though I wanted it. However, it was not long after the offer for the first t-shirt that I got another offer. This time I wasn’t so happy. Dear reader, dear friend, dear occasional stalker, etc., I am not a superhero! Unlike when I saw the one about being school bus driver, when I saw this t-shirt design, I didn’t laugh, smile, or even grin; it ticked me off. Folks, I don’t even joke about this. Pastors are already placed on unwanted pedestals, live in glass houses, and are thought of as superhuman. We, along with our families, are expected to have special powers of some kind, almost like Baptist wizards, impervious to the spells of the dark lord. But, we are not special, only our calling is. 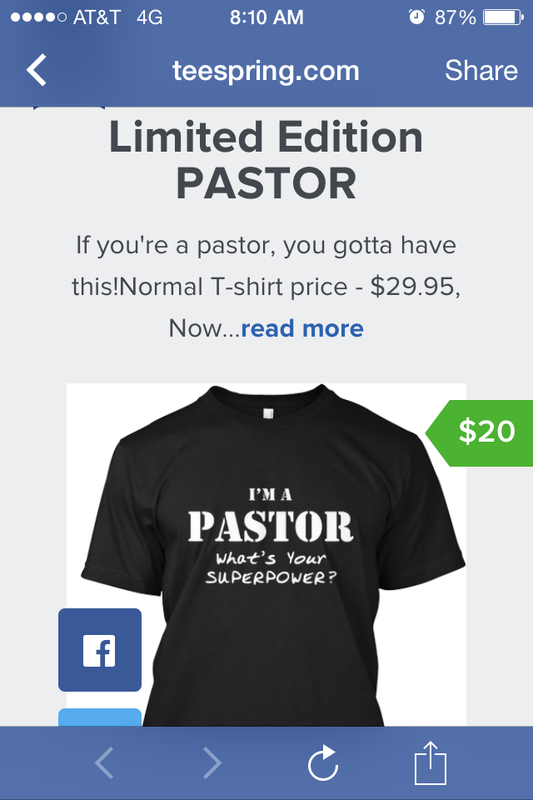 Pastors are not gifted with superpowers, and to suggest that only adds to the expectation that we can do everything perfectly, never getting tired, never mouthing off to our kids, and always having the right answer for everything. The only thing I can say is that God called me to a humbling “profession.” I did not choose to do what I do; He put the desire in my heart. And unlike other careers, like bus driver, fire fighter, school teacher, etc., no amount of education, training, or experience can make us successful at what we pastors do; only the living presence of Jesus can do that. I have no super power other than the power of Christ within me. As a matter of fact, the weaker I am – the more the “kryptonite” affects me – the more He is able to work through me (Phil. 4:13). I am only human. I have no superpower. All I have is a Super Savior.